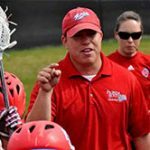 Marty Ward has a part of the Florida Southern men's lacrosse program for nearly its entire existence. He was named the head coach of the Moccasins in 2011 after spending one season as an assistant coach for Florida Southern. Since Ward took over the helm of the program, the Moccasins have posted an overall record of 58-50, and have been ranked in the USILA Top 20 a total of seven times. During his time at Florida Southern, the program has produced four all-Americans and 48 all-conference selections. In Ward's first three years, Florida Southern competed in the Deep South Conference and produced 22 all-conference honorees. Ward was named as the DSC Co-Coach of the Year in 2011 after leading the Mocs to the conference title game. FSC would make a repeat trip to the Deep South championship game in 2012. Since the Moccasins began competing in the Sunshine State Conference in 2014, Florida Southern has produced 26 all-conference selections, including the 2015 SSC Player of the Year (Dane Sorensen) and 2014 Co-Newcomer of the Year (Grant VanOverbeke). Sorensen also earned third-team USILA all-America honors in 2015, joining DJ Lubs (honorable mention - 2013, 2014) and Austen Lison (third team - 2017) as Florida Southern's lacrosse all-Americans. Ward's teams have also excelled in the classroom, with 18 players earning the D2ADA Academic Achievement Award. The Moccasins have also had more than 100 players named to the SSC Commissioner's Honor Roll since Ward took over. Prior to joining Florida Southern, Ward was a standout goalkeeper at Division II powerhouse Limestone College, where he helped lead the Saints to a record of 55-9 in his four years. Ward was a two-time team captain and three-time all-conference selection at Limestone. In 2006, Ward was named the MVP of the Deep South Conference Tournament, was named an honorable mention all-American in 2005 and 2007, and earned the 2007 Carolinas-Virginia Athletic Conference Player of the Year Award. During his time in goal for the Saints, Ward was a part of four teams that reached the NCAA Division II semifinals, including a pair of title game appearances (2004, 2005). After graduating from Limestone in 2008, Ward spent one season as a student-assistant coach with the Saints. He spent the 2009 season as the head coach at Heathwood Hall Episcopal School in Columbia, SC, where he led his squad to a region championship. Ward has also had success as a goalkeeper for the Iroquois Nationals team, helping the squad to a bronze medal at the 2014 World Lacrosse Championships. He was also the starting goalkeeper for the Iroquois Nationals team that finished fourth in 2006. He has also served as a coach for the Iroquois Nationals U-19 squad, leading the team to a bronze medal at the 2012 Federation of International Lacrosse World Championships.